The traditional pulp and paper producers are facing new competitors in tropical and subtropical regions who use the latest and largest installed technologies, and also have wood and labor cost advantages. Due to the increasing global competition, the forest products prices will continue to decrease. To remain viable, the traditional producers need to increase revenue by producing bioenergy and biomaterials in addition to wood, pulp, and paper products. In this so-called Integrated Products Biorefinery, all product lines are highly integrated and energy efficient. Integrated Products Biorefineries present the forest products industry with a unique opportunity to increase revenues and improve environmental sustainability. Integrated Products Biorefinery technologies will allow industry to manufacture high-value chemicals, fuels, and/or electric power while continuing to produce traditional wood, pulp, and paper products. The industry already controls much of the raw material and infrastructure necessary to create Integrated Products Biorefineries, and Agenda 2020 partnerships are speeding development of the key enabling technologies. Once fully developed and commercialized, these technologies will produce enormous energy and environmental benefits for the industry and the nation. 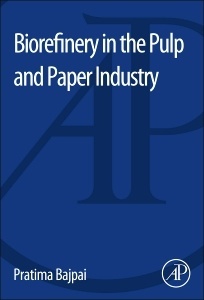 Biorefinery in the Pulp and Paper Industry presents the biorefining concept, the opportunities for the pulp and paper industry, and describes and discusses emerging biorefinery process options. This book also highlights the environmental impact and the complex and ambiguous decision-making challenges that mills will face when considering implementing the biorefinery.